About Moscow the recommendations about the shopping places, attractions, restaurants, activities and accommodation options can be found. Being so alive and absolutely iconic, Moscow is a modern city that managed to preserve its rich historical heritage and fine atmosphere. It is in Moscow where the traveler could feel the clash between the testaments of the Soviet past and the new capitalist opportunities. Nowadays, the city of Moscow is going through a strong revival of its old traditions, many cathedrals are restored, theaters are re-opening and traditional markets are becoming popular again. The city returns to its heritage, but also opens to the endless new options for growth and prosperity, boldly declaring its status as a capital and main city in Russia. Welcome to Moscow - the city of the traditional Russian culture, but also a busy metropolis that does not sleep! As a financial, scientific and political center, Moscow is the largest city in Russia and in Europe with almost 12 million citizens. The local people may seem to be uncompanionable at first, but once they get to know you they are hearty and communicative people with good manners and modern understanding of the world, and they are open to the new ways of life. Moscow is sometimes named “The Third Rome”, “The First Throne”, “The Whitestone One” and the “The Forty Forties” – phrases that catch its 860 years of history and the significant role the city played in formation of the state. In the years that followed the collapse of the Soviet Union, Moscow enjoyed improvement of its economy, increase of the foreign investments, new construction projects and overall prosperity. Modern and very busy, it seems that the metropolis does not sleep as everyone wants to jump to the next opportunity. The lifestyle of the city is a sweet mixture of old and new, offering what would one expect from the traditional Russian culture, alongside with various modern attractions like open-air concerts and theatrical performances, enormous shopping malls and busy night clubs. Moscow is the biggest northernmost metropolis on the globe, located on the site of the medieval fortress Kremlin and Moskva River in the European part of Russia. Moscow is served by five airports, which are Sheremetyevo and Doodedovo International Airports, Vnukovo and Ostafyevo International Airports, as well as Bykovo Airport. Travelers can also use the two river terminals. The city has an extensive metro system with twelve lines, no surprise the Moscow metro is one of the busiest in the world. Whether you wish to see the Kremlin Complex, to take photos of the Red Square, to eat hot rassolnik soup or to dance all night at a live music dance club while drinking vodka shots, the city of Moscow can offer you all of that. This site is a must-see place for many reasons, visiting the Armoury Diamond collection being one of them. The Kremlin complex further has many beautiful churches and vast gardens, different exhibitions, etc. If possible, go on a guided tour to get the most of your visit. 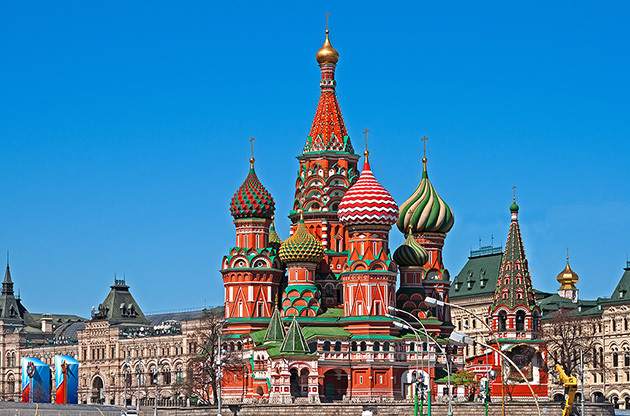 Placed at the very center of Moscow, the Red Square is a symbol of the city. It is characterized by long brick walls and black cobbled stones and is surrounded by the Mausoleum of Lenin, the History Museum and the Cathedral of St. Basil. The Mausoleum is closed on Mondays and on Fridays and the entrance is free. Once in Moscow, buy a ticket for a theatrical performance in Bolshoi Theater. It would be worth every ruble. Old Arbat Street presents the old spirit of Moscow with its souvenir shops, artists, cafes and restaurants. If possible, avoid the tourist traps and do not pay for the ridiculously overpriced souvenirs. Cheaper souvenirs including matryoshka dolls, as well as fur hats are available at Izmaylovskiy Market. This interesting museum exhibits work of art from the Western countries and hosts some of the best collections of the Impressionist and Post-Impressionist era artists. Shopping is a favorite activity for all locals in Moscow and all travelers that visit the city. There are enormous shopping centers and new shopping malls in Moscow, some of which set in the outskirts of the city, but all easily approachable by the metro service. Those who are looking for luxury brands should go to Bolshaya Yakimanka Str. and Petrovka Str., and those in search of mass brands should drop at Tverskaya Str. A new shopping mall near Kievski Station with any world-famous brands, plus a cinema center, dining area and a gallery. Placed next to the Red Square, arranged with many luxurious boutiques and well known labels. This is the mall to go to if you want to buy a special gift for your kid. Besides toys, there are also books and souvenirs. There is something for everyone when it comes to dining out in Moscow. Cheap fast-food places, family dining spots and posh gourmet restaurants are there to seduce you. Whatever your budget is and no matter which place you decide to visit, try the local cuisine – the meals are very tasty and palatable. Moscow has many tea saloons, but it is also a city of many bars and dance clubs. Most of them are concentrated within the Garden Ring and are open until the morning hours. Note that some of the luxurious night clubs have dress code and face control policy that you have to obey. The nightlife in this busy city is hectic and exciting and very tempting as well. A cozy restaurant that is designed in the form of a typical apartment from the Soviet era. The retro atmosphere is very pleasant and the dishes served are very tasty. These are special dishes that were very popular back then, especially the pelmeni and the varenniki you usually associate Russia with. The club spreads on five floors and is arranged in the style of the disco back in the 1980’s. It has a fantastic live music scene that is always busy during the weekends, restaurant for business lunch during the weekdays and a large open-air veranda. A breathtaking estate within a short ride from Moscow. Small historical towns rich in landmarks set in the heart of Muscovy Russia. An old country house that was once used by Lenin, now is a huge museum. Charming medieval town with many nice monasteries and churches. Have your identification with you during all day. Avoid the deserted streets when dark. Be aware of pickpockets, when in crowded stores and streets. As capital of Russia, Moscow organizes various international exhibitions, trade shows, conferences, congresses, fairs, symposiums and summits. Different fairs, seminars and meetings are held here every year. The city provides comfortable first-class accommodation and many high-end venues.